A Senate committee has released a scathing report on the state of school education for children with disabilities. The cross-party Education and Employment References Committee chaired by Labor Senator Sue Lines recommended more funding to assist students with a disability and the schools that they attend, better teacher training and a more coordinated, national approach to identifying areas of need. Senator Lines told 7.30 she was "shocked" by the evidence the committee heard. "Parents told us they went to ministers, to the equal opportunity [commissioner], simply to get their child enrolled at the local school, which every other parent takes for granted," she said. "The first thing those parents were hit with, once they said they had a child with disability, was the schools threw up their hands and said: 'We simply don't have the funding'." The report found children with disabilities were often failed by mainstream schools, because many do not take the steps needed to teach those kids effectively. At the other end of the spectrum, many schools catering specifically for children with special needs can fail to challenge them enough. The committee, dominated by Labor and the Greens, recommended that the needs-based funding for children with disabilities that came out of the Gonski education reforms be re-implemented. Parents of children with disabilities were critical of the way their children were being treated in schools. 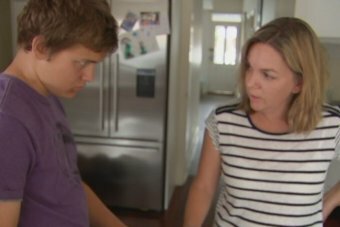 Stephanie Gotlib, whose 16-year-old son Adam has autism, told 7.30 it was not OK for families to have to "fight and fight and fight" for the most basic aspects of their children's' education. Ms Gotlib is the chief executive of Children with Disabilities Australia, which made a submission to the Senate committee. She agrees with the committee that there needs to be a national plan to establish directions for students with disabilities. "At the moment I think there's a lot of talk and focus, understandably, on funding, but we need to be very clear around what we're going to do with that funding, and what the outcomes are and how we're going to measure them for students with disability," she said. "This is an issue that has gone on for a long time." Melanie Wineberg has seen her 11-year-old son Harry, who has a rare brain condition called Olivopontocerebellar Atrophy, bounced around the education system, through mainstream and special schools, and dual enrolment in both. She said the system had failed her son. "He was in grade four and he couldn't read," she said. "In the end it was a speech pathologist, not a teacher, who taught him to read. "It's frightening to think that there is a culture that we label children at such an early age and almost put a limit on them." Shannon Walker, who has worked with principals and teachers on accessing disability funding and adapting schools' teaching methods to reach children with special needs, said she found a system in crisis. "[Schools] tried to support students who were struggling in big classrooms," she said. "They wanted to [help]. They knew the expectation was there, but they didn't have the skills and resources to really meet the needs and they felt like they were letting the children down." Ms Gotlib told 7.30: "I was working with a young boy last year and he was seven. And he'd been suspended about 15 times for huge periods of time and had been to school for about two days in the last three months. Lifting the amount of teacher training on managing students with disability is one of the key recommendations of the Senate committee's report. Currently, student teachers only receive up to two weeks of compulsory training and often enter the classroom with no idea how to cope with complex behaviour. Last year, the Federal Government promised to increase that funding in 2016, after five years of comprehensive data from all the states and territories was completed. But that data has been delayed after some states questioned its accuracy. The committee has recommended its release as a matter of urgency so the funding can roll out. Ms Gotlib said it was time for action. "We don't just need another set of recommendations that sits on a shelf."